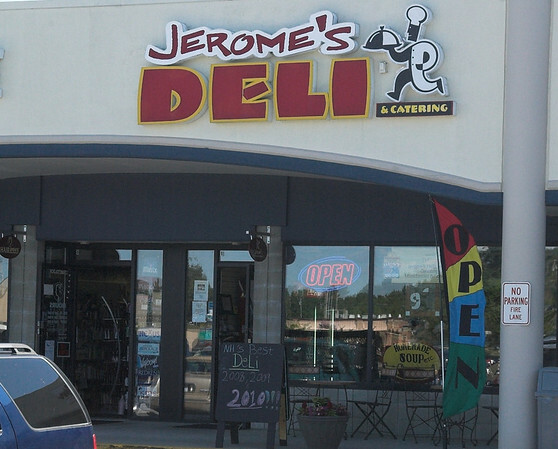 With seat-yourself dining, friendly staff, and a checkerboard-like theme, Jerome’s is a true deli through and through. The small and cozy dining area offers short or tall tables and chairs, as well as outdoor seating when the weather’s nice. Jerome’s offers a small but diverse menu. Salads on the menu include Garden, Caesar, Greek, Steak Tip and Spinach. Sandwiches include Stuffed Turkey, Chicken Pesto, Cajun Chicken, Honey Ham Melt, and the Wise Guy. Jerome’s also offers build your own sandwiches with choices like pastrami, turkey, ham, corned beef, roast beef, and Mortadello, as well as bread choices like white, wheat, pumpernickel, and spinach wraps. Sides can be ordered in three sizes, and include potato salad, pasta salad, coleslaw, and marinated salad. All sandwiches include a pickle and chips. All sandwiches at Jerome’s are $6.50. Salads range from $4 to $6.50. Jerome’s is open Monday to Friday from 10:30 AM until 8 PM and Saturday from 10:30 AM until 4 PM. They are closed Sunday. Visit Jerome’s at 44 Nashua Road, or online.